If you want us to visit, usually two or three team members will do a preliminary site investigation. Often this is enough to work out what's going on and solve your ghost problem. If not, we can arrange for a larger team to investigate the site. This may involve late-night access and setting up certain equipment that we use. (We really like it when things get to this stage!) But it doesn't have to become like one of those TV ghost shows - we won't do anything to alarm your neighbours. After the investigation, a confidential report is prepared, including copies of relevant photos, sound files and video, and given to you, our client. We won't put any information or photos online unless you would like us to. We treat all aspects of the investigation as private unless by agreement. We can remain in touch with you in case of further unexplained occurrences, and we can usually revisit the site if necessary. None of this costs you any money! 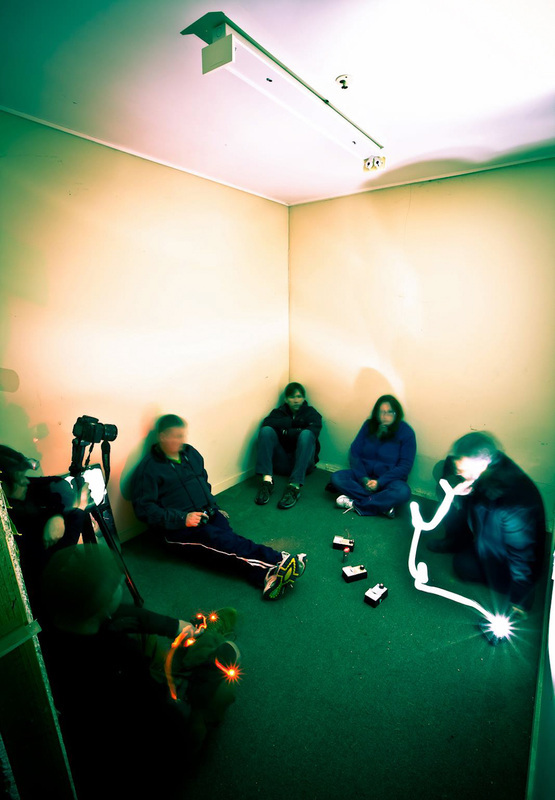 We do it to try to be of some help, and also out of personal interest and curiosity - to learn more about the nature of paranormal phenomena and how they are experienced by people. EVP session in progress at the Wellington Fever Hospital (photo: Kate Griffiths). "A deeply emotional thought, for example, may have capabilities little dreamed of by its conceiver; effects not merely transient nor confined to a lifetime, nor limited to any definite number of years nor to any limited space." - Elliott O'Donnell, from 'Haunted Britain', 1948.